The Natural Hazards Partnership has a key role to play in UK risk assessment. We provide expertise and advice, coordinates its internal partners and delivers independent reviews regarding natural hazards for the UK’s National Risk Assessment (NRA) and National Security Risk Assessment (NSRA). 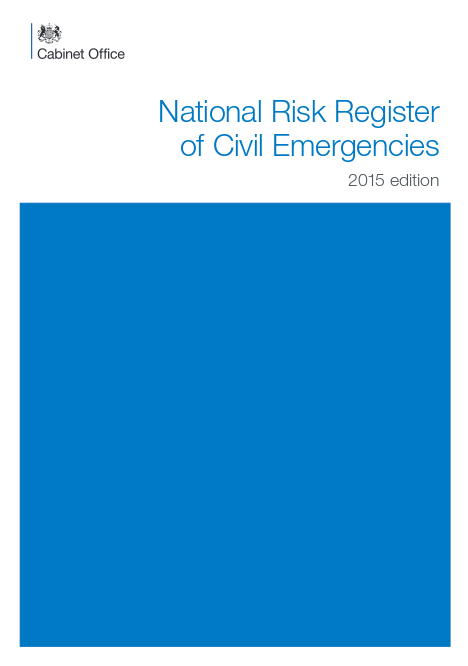 Publically available information from these assessments is provided in the National Risk Register of Civil Emergencies (2015 edition). Of these products, the NRA considers risks that could affect the UK mainland within the next five years. The NSRA considers risks that could affect UK interests worldwide within a five to twenty year timeframe. Identification of potential natural hazards for inclusion and assessment. Coordination of our constituent organisations and agencies to support lead government departments in developing robust ‘reasonable worst case scenarios’ for natural hazards. Provision of expertise to deliver an independent review function for natural hazard risks within the NRA. Interdependency between risks continues to be an emerging area of work for the NRA. We consider multi-hazard events to be a key priority for future research. This includes modelling of hazards likely to occur either simultaneously or sequentially, for example as a result of the same set of circumstances such as drought, extreme heat, and wildfires.